The Vitra Black Collection wraps some design classics of modern furniture history in a black robe and thereby gives them a noble, mysterious look. Lovers of the colour black will find all that their heart's desire in the designs of Charles and Ray Eames, Alexander Girard and Maarten Van Severen. 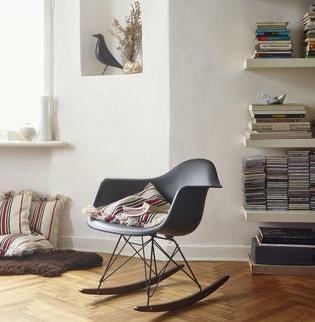 From furniture classics such as the Eames Lounge Chair & Ottoman or the popular Vitra rocking chair RAR to the playful Eames Elephant, everything is there to make the hearts of design fans beat faster. In addition the Vitra Black Collection includes home accessories such as George Nelson's Wall Clocks, the Wooden Dolls Cat & Dog and the Vitra Wardrobe Hang It All.